Can the County's Permitting and Inspection Service be Fixed? In his weekly ARLnow.com column today, Peter Rousselot asks, "Why can't Arlington Fix Permitting and Inspection?" He first cites a prior article that "chronicled inspection delays plaguing the opening" of a new beer garden, and added, "Last week’s article cross-referenced a 2016 ARLnow story detailing complaints by former Virginia Del. Rob Krupicka. He vented about navigating Arlington’s permitting and inspection process to open a donut shop." In addition, he wrote, "This spring, the permitting process for home remodeling was slammed in Arlington Magazine." "Arlington correctly preaches that continually attracting small businesses is vital to our economic future. But, Arlington’s permitting and inspection practices badly undermine its sermons. "Arlington County is still trying to compete using paper in a digital world. Meanwhile, APS is giving iPads to every elementary school student in grades 2-5. "When will someone be held accountable for the long-standing deficiencies in permitting and inspection? Why can’t Arlington County play this game?" We've growled on numerous occasions of the county's struggles with reducing the office vacancy rate -- most recently June 23, 2017. We also growled on February 6, 2017 after the state and Arlington County gave Nestle $16 million to move their headquarters to 1812 North Moore Street in Rosslyn. It sure seems the Arlington County Board could save Arlington taxpayers some tax dollars, and avoid handing out subsidies to lure corporations to Arlington by assuring the permitting and inspection service was first rate. The County Board should first staff-up its County Auditor with several more "junkyard dogs" and assign them to do an indepth audit of the permitting and inspection function. Unfortunately for Arlington County taxpayers, the County Board hasn't seen fit to provide the County Auditor with the required resources. Interestingly, one of the commenters, an architect, takes exception. In fact, he says, "no other localities have any better system, and in fact, Arlington is the easiest to navigate." That may be true, but a fair and independent audit of the permitting and inspection function would tell us what needs fixed and what doesn't. Growls readers who take the time to read this week's Peter Rousselot column should take a few extra minutes to read the 40 comments that are currently posted. In a CNSNews.com article today, Terry Jeffrey reports, "Americans on average spent more on taxes in 2016 than they did on food and clothing combined, according to data released this week by the Bureau of Labor Statistics. In addition, he added, "The same data also shows that in three years—from 2013 to 2016—the average tax bill for Americans increased 41.13 percent." "In 2016, according to BLS, “consumer units” (which include families, financially independent individuals, and people living in a single household who share expenses) spent more on average on federal, state and local taxes ($10,489) than they did on food ($7,203) and clothing ($1,803) combined ($9,006). "The average tax bill for American “consumer units” increased from $7,423 in 2013 to $10,489 in 2016, according to data released this week by the Bureau of Labor Statistics. "The tax-and-spending data was collected as part of the BLS’s Consumer Expenditure Survey, which is conducted for the BLS by the Census Bureau. The survey measures the expenditures and incomes of American consumers." He also reported, "From 2013 to 2016, overall personal taxes climbed from $7,432 to $10,489—an increase of $3,057 or 41.13 percent. Federal income taxes climbed from $5,743 to $8,367—an increase of $2,624 or 45.7%. State and local income taxes climbed from $1,629 to $2,046—an increase of $417 or 25.6 percent. Other taxes climbed from $60 to $75—an increase of $15 or 25 percent." The five-page economic news release from the Department of Labor's Bureau of Labor Statistics (BLS) can be found here. Given that annual wage and salary have not increased significantly over the past few years, it seems government greed over these years has been nothing but flagrantly egregious. "The U.S. spends more per capita on prescription drugs than any other high-income country — and that spending has grown much faster than in comparable countries over the last two decades, lifting the annual cost per person to between 30 percent and 190 percent higher than in countries such as Canada, France, Germany, Sweden, Switzerland and the U.K."
"A new report from The Commonwealth Fund examines why that is — and the conclusion sounds almost tautological: U.S. spending is so high primarily because we pay more for prescription drugs than buyers in other countries. "The report points to the “relative lack of price control strategies” as one possible reason prescription drug prices are higher in the U.S.: 'In the U.S., health care delivery and payment are fragmented, with numerous, separate negotiations between drug manufacturers and payers and complex arrangements for various federal and state health programs. And, in general, the U.S. allows wider latitude for monopoly pricing of brand-name drugs than other countries are willing to accept.'" Rosenberg concludes, saying, "Changing the trend in drug prices may not be easy. The Commonwealth Fund's report abstract, executive summary, and a link to the entire 44-page report are available here. The Commonwealth Fund is a private foundation that supports independent research on health care issues and makes grants to improve heath care practice and policy. At the National Taxpayer Union (NTU) blog last week, Tom Aiello reported, "Earlier this month, Cook County, home to the city of Chicago became the latest and largest government in the United States to implement a sugary beverage tax." ". . . Such taxes are gaining popularity across the nation due to their ability to yield revenue to cash strapped cities. In an effort to plug a budget shortfall of $174 million, Cook County intends to raise $68 million in 2017, and nearly $200 million a year from this tax. While the government is sure to gain a lot at the expense of many, they would be wise to closely examine the economic effects and the demographics of the people hit by similar soda taxes across the nation. "This tax will make Chicago one of the most expensive areas in the nation to buy soda. Recent analysis by the Illinois Policy Institute found the tax will increase a 12-pack of soda by $1.44. Combined with Chicago’s own soda tax and Illinois’ sales tax, nearly 33 percent of the entire cost of soda will be due to taxes. Not only will consumers face higher prices, but they will also be left with fewer options in the grocery aisle. In Philadelphia for example, PepsiCo announced it would stop selling all 12-pack and 2-liter bottles to grocery and convenience stores because there was such a drastic decline in demand. "Higher prices on consumers will force many buyers of soda to shop outside of the city. However, low-income individuals tend not to have the means of transportation to buy soda outside the city. These people are usually stuck paying the full price and spend a greater portion of their income on taxes. But for those with the means of transportation, stories from the Chicago region have already surfaced of consumers shopping in nearby areas to avoid the tax. These taxes hurt not only small business owners, but also the people who become unemployed as stores just cannot afford that additional employee. In Philadelphia, for example, many small stores have reported a near 50 percent drop in sales, resulting in some laying off 20 percent of their employees. "Local distributors of Coca-Cola and PepsiCo have explicitly pointed to Philadelphia’s soda tax as the reason for the recent layoffs of 140 workers from their distribution centers. In fact, Philadelphia has raised about 15 percent less than originally estimated because they did not anticipate such a decline in soda sales. So, as the government rakes in less than anticipated, they are doing so at a great cost of middle-class jobs and fewer opportunities for Americans to succeed as business owners. "It is imperative for Cook County, and other cities considering such taxes to carefully examine all the unintended consequences of this revenue measure." For more on Cook County's soda tax, this August 3, 2017 Chicago Tribune article is chock-full of details, and includes a short video. "A number of cities like Seattle and San Francisco have enacted soda taxes, and states occasionally propose them. Generally, these policies are aimed specifically at combating obesity and the consumption of sugar-sweetened beverages. The stated goal of the Philadelphia soda tax as a revenue-raising measure differs from other areas, and it makes the city’s underperforming tax collections all the more noteworthy. "Despite constituent support for the programs funded by the tax, the actual revenue for programs remains unstable due to poor collection performance, with potential that those revenues will continue to fall. The legal battles and consumer angst the tax has attracted make the tax unattractive as well. Other localities wishing to avoid these travails should seek funding for programs with broader-based, more predictable tax instruments." Investor's Business Daily (IBD) editorialized about "Philly's Soda-Tax Fiasco" on August 11, 2017. IBD started off saying, "Hey, here's a great idea: Let's tax soda to the hilt, rake in tons of money, and spend it on Pre-K education. What could possibly go wrong? Well, the city of Philadelphia just found out." The Teamsters Union seemed happy about the soda tax's implementation. According to Crain's Chicago Business, "amid soda tax war" the union thanked Cook County Board president Toni Preckwinkle "fpr a good new deal" And finally, Forbes contributor Bruce Lee reported last November that five more locations passed soda taxes. Taxpayers just can't be too vigilant! For all the risks involved in implementing ever more exotic taxes, you would think the panjandrums would find it easier to control spending. Apparently not! In an article posted today at Washington Free Beacon, Ali Meyer reports, "Welfare reform implemented in Kansas caused individuals to reenter the labor force while earning higher incomes, according to a report from the Foundation for Government Accountability." "Kansas Republican Gov. Sam Brownback took office in 2011 and began to implement welfare reform after the previous governor, Kathleen Sebelius, had relaxed requirements for those on welfare to work or search for employment. "From 2000 to 2011, the number of able-bodied adults on cash welfare was increasing by 42 percent in Kansas, while nationally the number on welfare had dropped by a third. "Brownback first began reforming welfare by strengthening sanctions for those who received cash assistance by implementing a three-month ban on those who refused to meet work requirements. If an individual failed to meet the requirement for a second or third time, the ban was prolonged for six months to a year. "Brownback also began collecting employment and wage data on 17,000 individuals who had left the Temporary Assistance for Needy Families (TANF) program for a duration of four years to see if these individuals became self-sufficient. "The study found that those who left welfare saw their earnings increase by 104 percent in one year, which is $20 million more than they had while on welfare. In four years, these individuals saw their incomes increase by 247 percent. "Individuals who left welfare are also better off because they found employment in more than 600 different industries and found long-term, high-paying jobs." The 14-page report from the Foundation for Government Accountability is available here. FGA's July 31, 2017 press release announcing the report is here. Growls readers concerned that Virginia has not undertaken welfare reform are also urged to write to their state legislators. The following legislators represent Arlington County in the Virginia General Assembly: Senators (Adam Ebbin, Barbara Favola, or Janet Howell) and Delegates (Rip Sullivan, Patrick Hope, Alfonso Lopez, or Mark Levine). Contact information for members of the General Assembly can be found here -- use one of the "quick links" to locate the senator and delegate who represent you. "An unlimited power to tax involves, necessarily, a power to destroy; because there is a limit beyond which no institution and no property can bear taxation." According to their press release on Wednesday, "Citizens Against Government Waste (CAGW) named Rep. Don Young (R-Alaska) its August 2017 Porker of the Month for advocating for the 'road to nowhere.'" "On July 20, 2017, the House of Representatives passed H.R. 218, Rep. Young’s King Cove Road Land Exchange Act, which would permit the building of a road between the two remote Alaska towns of King Cove (with a population of 989) and Cove Bay (with a population of 122) through the Izembek National Wildlife Refuge. "CAGW President Tom Schatz said in a statement: 'Rep. Young has a long track record on the wrong side of taxpayers. From the bridge to nowhere, to his support for earmarks, and now his advocacy for a road to nowhere, he is the poster representative for irresponsible spending. Instead of casting blame, Rep. Young should end his earmark crusade for once and for all.'" Citizens Against Government Waste is a nonpartisan, nonprofit organization dedicated to eliminating waste, fraud, abuse, and mismanagement in government. For more information about the organization, click here. A List without Arlington County? On Tuesday, we growled that Virginia ranked third, nationally, in benefiting from the federal home mortgage interest tax deduction, based upon an analysis by the Tax Foundation. Today, the Tax Foundation's Huaquin Li posted an analysis of which areas benefit most from the home mortgage interest deduction. Her post included a list of the "top ten U.S. counties for average home mortgage interest deductions" at their Tax Policy blog. Topping the list is Virginia's Loudoun County where the average home mortgage deduction was $6,365. Other Washington, DC regional jurisdictions in the top ten counties were Falls Church (often included as a county in federal statistics). Fairfax County, Calvert County, MD, Stafford County, and Howard County, MD. 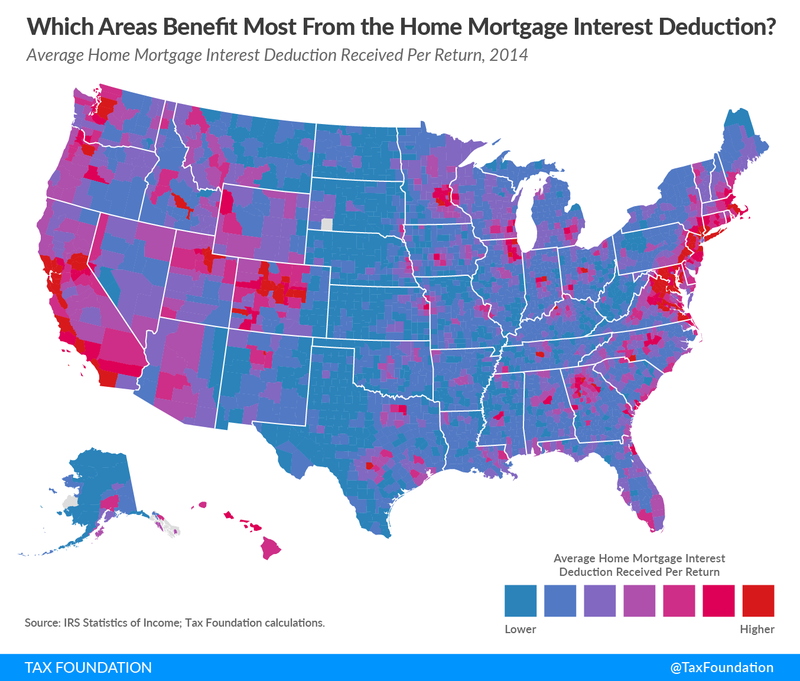 The following Tax Foundation map shows the areas of the United States that benefited most from the home mortgage interest deduction (roll over a larger version of the map provides amounts for each county). "The map below shows that there is tremendous variation in terms of the average home mortgage deductions among counties. Overall, the average deduction in a county spans from a low of zero to a high of $6,365. There is also strong variation among counties within the same state. In Virginia, for example, filers in Dickenson County take only $216 on average. However, filers in Loudoun County in northern Virginia can take a home mortgage deduction of $6,365 on average." If you found the Tax Foundation's analysis helpful, take a minute to thank them. Learn more about the Tax Foundation by clicking-on here. "The most difficult subjects can be explained to the most slow-witted man if he has not formed any idea of them already; but the simplest thing cannot be made clear to the most intelligent man if he is firmly persuaded that he already knows, without a shadow of a doubt, what is laid before him." HT Jennifer Marohasy, "Big data finds the Medieval Warm Period – no denial here," The Spectator of Australia. 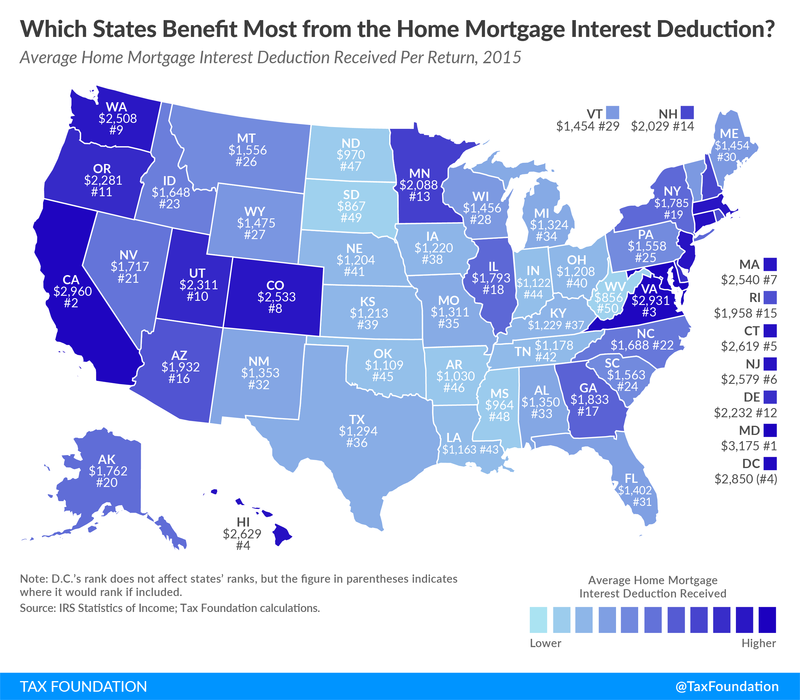 Earlier this month, the Tax Foundation's Amir El-Sibaie posted an analysis at their Tax Policy blog showing the states that benefit most from the home mortgage interest deduction." "Earlier this week, we reported that the Trump administration may consider reducing the cap on the home mortgage interest deduction from a maximum of $1 million acquisition debt to $500,000. We estimated that this proposal could raise as much as $95 billion to $300 billion over the next decade, depending on how the cap is structured. We also found that the tax increase would primarily fall on high-income taxpayers because they are more likely to own larger homes and have more mortgage debt. Middle- and lower-income taxpayers would be much less likely to face a tax increase. "Changes to the home mortgage interest deduction would also impact certain parts of the country differently. There is a large degree of geographic disparity in who claims the mortgage interest deduction. Below is a map that shows the average deduction amount taken per tax return, or the total amount of home mortgage interest deducted in a state divided by the number of tax returns in a state. "Two primary factors influence how much home mortgage interest is deducted in a state: state housing prices and state income levels. "Regional housing prices directly impact mortgage interest payments. In areas where land is scarce, such as Hawaii, the low levels of supply will push prices up and increase the amount of interest paid on mortgages. The opposite is also true. In states such as North and South Dakota where land is plentiful, low land prices will directly reduce the number of individuals claiming the home interest mortgage deduction and the amount of the deduction. "Income levels also impact the amount a state claims in mortgage interest. Higher-income taxpayers are more likely to purchase larger homes and have more mortgage debt. In addition, they are more likely to itemize to begin with because they pay more in state and local taxes and make more charitable contributions—the two other major itemized deductions available to taxpayers." Wouldn't it be a whole lot simpler if we forgot about the home mortgage tax deduction, as well as the other deductions and so-called "tax expenditures," and adopt a flat tax, or the FairTax? To learn more about the Tax Foundation, click here. According to Ali Meyer of the Washington Free Beacon today, "An estimated $72 million in Medicaid payments were made to potentially ineligible beneficiaries in Kentucky, according to an audit from the agency's inspector general." "The audit found the state agency in Kentucky did not always determine eligibility status for Medicaid benefits in line with federal and state requirements and that the agency did not keep paperwork noting it verified citizenship status. "In order to receive Medicaid benefits, the state must verify citizenship or nationality status and have documentary evidence. The state can conduct this verification process through the Social Security Administration. "The audit found the state determined eligibility status for Medicaid benefits without having such documentation and could not show that they received a citizenship verification response from the Social Security Administration. "The state agency did not always meet Federal and State requirements when making eligibility determinations because of both human and system errors," the report states. "The state agency did not always perform, or maintain documentation that it had performed, identity-proofing because of both human and system errors related to processes implemented in response to the ACA that affected eligibility determinations for non-newly eligible Medicaid applicants." "In addition, when an individual applies for Medicaid coverage through the state marketplace, the individual must go through identity-proofing, which includes the collection of sensitive information such as birth date and Social Security numbers. The audit found the state did not conduct this process or provide documentation for this process for 13 beneficiaries. "On the basis of our sample results, we estimated that during our 6-month audit period, approximately 8 percent of non-newly eligible beneficiaries in Kentucky were potentially ineligible, and approximately 3 percent of federal payments were made to those beneficiaries," the report states. "As a result, we estimated that Kentucky made federal Medicaid payments on behalf of 69,931 potentially ineligible beneficiaries totaling $72,763,721." "Auditors recommend that Kentucky show it verified citizenship and identity by providing documentation. The state agency agreed with the recommendations." The 20-page report by the U.S.Department of Health and Human Service's Office of Inspector General can be found here. The Washington Free Beacon's Ali Meyer reported this morning, "A majority of Americans say that taxes are too high and the tax code is too complex, according to a poll from the American Action Network." "The Trump administration and Congress are shifting their focus to tax reform and poll findings show that Americans support a redesign of the tax code that lowers rates and makes it more simple and fair. "A majority of all Americans, 57 percent, believe that the tax code needs to be overhauled or revamped in a major way. Another 62 percent of Republicans and 46 percent of Democrats say that their taxes are too high. "Ninety percent of Americans say that the personal income tax system is either very or somewhat complex and 60 percent of respondents say that they would rather a flatter and simpler tax code than one that increases taxes on the wealthiest and is more progressive. "A majority of Democrats, 70 percent, say they want members of Congress to work across the aisle in a bipartisan fashion to get tax reform done. "Seventy-seven percent of respondents believe that tax reform will impact them positively whether it be through economic growth, increasing jobs, or helping out their own finances." "Whether in California or Nebraska, Americans strongly recognize our outdated and uncompetitive tax code has left middle-class families behind," said Bliss. "These results send a loud warning that those looking to stand in the way of tax reform will pay a significant price." "Congress must capitalize on this opportunity to deliver meaningful tax reform that will create more jobs, cuts taxes for working families, and empowers job creators to compete with countries like China," he said. "To succeed and enable growth for all, every member of Congress must prioritize reform that lowers rates, eliminates loopholes and puts American workers and job creators first." "When you juxtapose a conservative view versus a progressive view on tax reform, 60% say a simpler, flatter and fairer tax system is more important than one that is more progressive and increases taxes on the wealthiest." Citizens Against Government Waste (CAGW), on July 25, "named former Rep. Jason Chaffetz (R-Utah) its July 2017 Porker of the Month for advocating for taxpayer-funded housing for members of Congress." "Ironically, the interview was conducted four days before Rep. Chaffetz resigned from Congress and abandoned his chairmanship of the House Committee on Government Reform and Oversight in order to pursue a lucrative television career. "Perhaps his time in Washington has clouded now former Rep. Chaffetz’s idea of what qualifies as a decent quality of life. For example, his annual House salary of $174,000 was nearly three times the median annual income of one of his former constituents. "Furthermore, there are ample reasons why Congress does not deserve additional taxpayer benefits. The national debt nearly doubled during Rep. Chaffetz’s time in Congress. Government-wide improper payments have risen to $144 billion in FY 2016. Congress has failed to complete its own budget process on time for 20 consecutive years, which mirrors Congress’s nearly 20-year failure to balance the budget. A Gallup poll shows congressional job approval at an embarrassing 19 percent. "Rep. Chaffetz is not the first congressman to propose additional taxpayer-funded benefits. Former Rep. Jim Moran (D-Va.) made a similar statement on April 3, 2014, just before his retirement. "According to government figures, debt is $19.8 trillion and the GDP is $19.2 trillion. In other words, debt is 103 percent of GDP." "According to the latest Pew Research Center analysis, "The nation's debt is now bigger than its gross domestic product, which was an estimated $19.23 trillion in the second quarter. Debt as a share of GDP rose steeply during and after the 2008 financial crisis. Since 2013 it has equaled or exceeded GDP, which had not been seen since the end of World War II." "The interest on that debt is sky high: $276 billion this fiscal year. That's 6.8 percent of all federal outlays. "But, said Pew, that's a good deal because interest rates are low, just 2.2 percent. "And China doesn't hold a lot of U.S. debt. Said Pew, "mainland China only held about 5.8 percent of the total debt, or about $1.15 trillion. Hong Kong, a ‘special administrative region' of China, held another $202.6 billion. China was the top foreign holder of Treasury securities, ahead of Japan, which held just under $1.1 trillion." 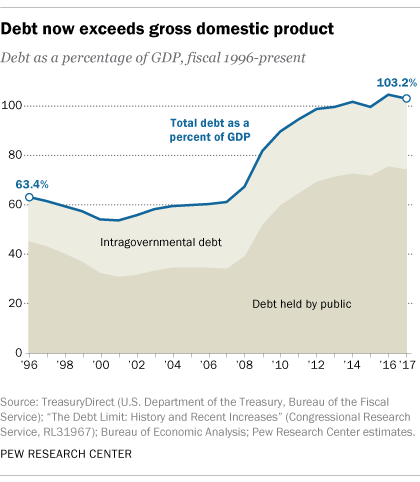 In this FactTank piece, the Pew Research Center's Drew DeSilver reports on "5 facts about the national debt." For a helpful view of the federal budget picture, take a look at this infographic from the Congressional Budget Office. In a report on 'fiscal space, from the Committee for a Responsible Federal Budget we growled on September 27, 2016 whether the federal government has sufficient 'fiscal space.' The Committee concludes, however, the federal government is poorly equipped to handle the next recession. A news item, yesterday, in the Arlington Sun Gazette reports "Arlington sees ups and downs on SOL results." "The movements were relatively small, but pass rates for Arlington Public Schools students on Standards of Learning tests taken last spring were up in 11 cases, down in 12 and unchanged in six from a year before, according to new state data. "The county school system met or exceeded statewide passing rates in all but one of 29 exams, and exceeded the statewide rate by 5 points or more on 17 of the assessments. "State-mandated SOLs test student learning in coursework including math, reading, writing, science and social studies. Students are tested beginning in third grade. "In recent years, the Virginia Department of Education has been ramping up the difficulty level on some tests; there were no major changes but some tweaks made to tests from the 2015-16 to 2016-17 school years." "State Superintendent of Public Instruction Steven Staples said year-over-year changes were less important than the “long-term, upward trend” state officials were seeing. "Scores on SOL tests are among the criteria used by state officials to determine accreditation levels for Virginia schools. Accreditation ratings for school districts and individual schools will be announced in September." The Arlington Public Schools (APS) press release, discussing the test results in more detail, can be found here. Source: epigraph in Victor Davis Hanson's January 14, 2014 National Review Online column. "The average government salary in 2016 was $83,072, according to a report on federal salaries from the Office of Personnel Management released in July. "By comparison, the average wage index for the U.S. in 2015, the most recent available calculation, was $48,098, according to the Social Security Administration." "Federal workers are also generally older, more educated, and more experienced than most workers in the private sector, according to a 2012 Congressional Budget Office study. The CBO also found that government employees make slightly more than their counterparts in the private sector on average. "The disparity depends greatly on the employee’s level of education. Federal non-military workers with no education after high school earned 21 percent more than the average non-government worker. Employees with bachelors and masters degrees earned about the same amount in the government as in private enterprises. Government employees with a professional degree or doctorate, however, earned about 23 percent less than private sector counterparts. "While the federal workforce is hardly representative of the entire U.S., the gap disparity between average salaries has been growing for some time. In 2001, the average government worker made 1.39 times what non-government employees made, but that ratio grew to 1.58 by the middle of 2016, according to BLS data compiled by Bloomberg News." The nine-page Office of Personnel Management (OMB) report, "Salary Information for the Executive Branch Fiscal Year 2016" can be found here. It contains six tables, which breakdown salaries by major agency, state, gender, ethnicity/race, and occupational category. The average American wage is based upon the National Average Wage Index from the Social Security Administration.The indexing series provides 1951 -- 2015 data. You can find it here. At the Washington Free Beacon today, Elizabeth Harrington reports, "Environmental Protection Agency employees under the Obama administration earned emergency overtime pay without justification, in violation of agency policy." "The inspector general for the agency released an audit last week finding "numerous instances of noncompliance" of the emergency overtime pay system for employees in Seattle, Wash.
"Employees must receive a waiver from biweekly pay caps if they are to receive extra pay for working during a natural disaster, or for conducting "mission-critical" work. The inspector general found just a fraction of employees in the final three years of the Obama administration who received overtime pay had requested a waiver. "The Pacific Northwest region could provide only 15 requests that cited emergency and mission-critical work. "The Human Resources Officer for the region must sign off on waiver requests, according to EPA policy. Only one out of the nearly 80 instances of emergency overtime pay was signed by the HRO. She also noted, "The inspector general said without proper oversight, taxpayer funding could be wasted on overtime pay that is not justified." The EPA Inspector General performed the audit because it "received a hotline complaint alleging mismanagement by EPA Region 10 of its biweekly pay cap waiver process. The complaint alleged that there appears to be an absence of management control for approving biweekly pay cap waivers that is contrary to agency policy. Examples cited included: approvals for non-emergencies, a lack of review by the human resources office, missing supporting documentation, and inadequate justifications." You can access the 18-page report by clicking here. In early April 2017, Investors' Business Daily (IBD) featured an editorial that warned America's taxpayers, "In its latest long-term budget outlook, the Congressional Budget Office warns that our budget is seriously out of whack and endangers our nation's future. While the report will likely be ignored in Washington by politicians who like spending your money, American taxpayers would be wise to heed its message." "The CBO has its issues as a prognosticator, especially when it comes to "scoring" congressional bills. But its long-term forecast for the budget is the equivalent of a horn sounding on a faraway train coming down the track: If you're on the track, you ignore the sound of that horn at your own peril. "In recent years, we have engaged in often-bitter political debates over what in budget terms is small change, without addressing the bigger issue that we've built an unsustainable mess of a budget. "The CBO's numbers are persuasive — and more than a little scary. 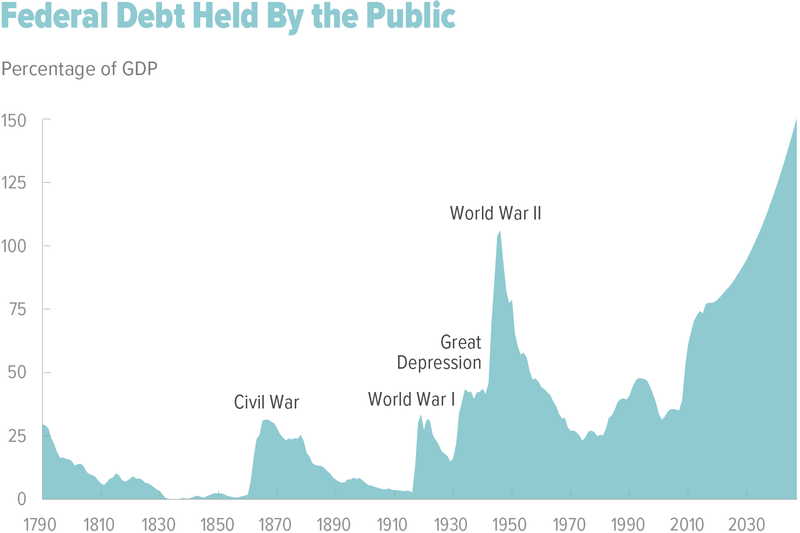 "Right now, debt held by the public is about 77% of GDP. By 2047, if current trends hold, that will grow to 150% of GDP. Imagine having credit card debt more than 50% larger than your income. How would you pay it? That's where we'll be. "We're being driven toward a kind of national bankruptcy, in which tax revenues over the next 30 years will rise from 17.8% of the economy to roughly 19.6%, while spending will soar from about 20.7% of GDP to a shocking 29.4%, leaving massive budget deficits of nearly 10% of GDP and soaring debts that will be difficult for an aging population with a shrinking workforce to pay off. "From about $14 trillion now, our public debt would grow to over $90 trillion. Repeat: $90 trillion. "What's driving this budget insanity? Entitlements. Social Security, Medicare, Disability, and interest on our growing debt. Those things together will grow from roughly 12% of GDP this year to almost 22% of GDP in 2047. "So 75 cents of every dollar the government collects will go to those three programs. That doesn't leave much room for stuff like defense, infrastructure and all the other things government now does. And our national politics will turn into a long, vicious battle between those who get checks from the government, and those who don't. It won't be pretty." The IBD editorial provides this additional warning, "As the CBO notes, if we wait even 10 years to address runaway spending, the tax increases or spending cuts required will have to be 50% larger than today to get the same results." "One motivating factor for addressing the approaching debt ceiling as soon as possible is the mounting list of items on the Senate’s agenda. "Several GOP senators, however, expressed the consistent Republican desire to make adjustments to the mandatory spending side of the federal ledger in any bill addressing the debt ceiling. Though some recognized the difficulty in doing so when bumping up against a possible default by the U.S. government. "Historically, Republican leadership has relied on Democrats to help pass a debt ceiling increase. Some Democrats, when asked, said they had not yet discussed as a conference what to do." ~ Mark R. Levin, "Liberty and Tyranny: A Conservative Manifesto"
For other books by Mark R. Levin, click here. CAGW Finds "USPS is in Financial Distress"
According to a press release today from Citizens Against Government Waste (CAGW), "Citizens Against Government Waste (CAGW) expressed continued frustration following the release of the United States Postal Service’s (USPS) third quarter financial report for fiscal year (FY) 2017." "The agency reported a loss of $2.1 billion in the third quarter, which was $573 million higher than the same period in 2016. Over the last decade, USPS has lost a total of $63.6 billion. USPS is currently in the midst of its 11th consecutive year of net losses. USPS has already defaulted on a total of $33.9 billion of benefit payments. On July 11, 2017 USPS bowed to union pressure and agreed to an across the board pay raise and added benefits. The Postal Reform Act’s costshifting of retirement funds to Medicare would further damage a program that will be insolvent by 2029. A March 2015 report by Sonecon CEO Robert Shapiro found that USPS has an $18 billion advantage over similar private sector companies. Even with these enormous financial benefits, massive agency losses persist. The U.S. Postal Service 3Q FY 2017 results are available here. Kudos to Citizens Against Government Waste for their work in holding government accountable. For more information about CAGW, click here. According to yesterday's Arlington Sun Gazette, "Six Arlington public schools have been named to the top tier in the Virginia Board of Education’s annual awards program, comprising two-thirds of all the schools that received the award statewide." "Arlington Traditional; Jamestown, McKinley, Nottingham and Taylor elementary schools; and Williamsburg Middle School earned the 2017 Governor’s Award for Educational Excellence, the top level in the annual awards program. "Statewide, only nine schools earned the top honor in 2017. In addition to the Arlington schools, they included Cooper and Longfellow middle schools in Fairfax County and Short Pump Middle School in Henrico County. "Arlington Science Focus School, Ashlawn Elementary School and Discovery Elementary School were among 145 schools statewide to receive the 2017 Board of Education Excellence Award, the second tier in the annual awards program." Given that Arlington continues to have the highest cost-per-student in the region, as we growled on November 21, 2016, we are happy to learn that some of the Arlington Public Schools are doing so well. Additional information about the awards, including schools and school divisions receiving them, can be found in this August 8, 2017 press release from the Virginia Department of Education. Kudos to the students of the six APS schools who helped their schools win 2017 Governor's Award for Educational Excellence. At the Washington Free Beacon today, Ali Meyer reports, "In 42 states, personal income grew from the past year, even after adjusting for inflation, according to a report from Pew Charitable Trusts." "Personal income includes wages and salaries, benefits from Social Security, Medicare, and Medicaid, as well as employers' contributions to retirement plans, contributions to health insurance, and income from property and rent. "On average, personal income grew across all states by 1.8 percent, but some states saw growth as high as 2.9 percent. "Compared with the previous year, Idaho, Washington, and Utah saw personal income grow by 2.9 percent. According to the report, personal income fell in Wyoming, North Dakota, Nebraska, Oklahoma, Alaska, Vermont, Iowa, and West Virginia, due to manufacturing, farming, state and local government, and construction weaknesses. "The study also evaluated how personal growth has fluctuated since the recession began in 2007. The group found that personal income growth has recovered unevenly since this time with certain states growing faster than others. "For example, there were 17 states in which personal income grew faster than the nation as a whole since the end of 2007. North Dakota's personal income has grown 4.2 percent since the recession, Texas's has increased 2.9 percent, Utah's has increased 2.6 percent, Colorado's has increased 2.3 percent, and California's has increased 2.2 percent. "One of the longest U.S. economic expansions has lifted personal income in all states above pre-recession levels," the report states. "But growth has varied, ranging from a constant annual rate of 0.7 percent in Illinois and Nevada to 4.2 percent in North Dakota." The Pew Charitable Trusts report, "Slow Growth for State Personal Income Persists in 2017, " provides even more detailed data, including downloadable data, which includes data by state. For example, personal income grew, nationally, at a 1.7% annual rate since Q4 2007. By comparison, Virginia's personal income grew at 1.6%. Over the past year, however, the growth of personal income in Virginia did much better than the national average. While the national growth rate over the past year -- Q1 2016 to Q1 2017 -- was 1.8%, Virginia's personal income growth was 2.4%. [Map showing the 42 states whose personal income grew over the past year was deleted, but is available in the Pew Charitable Trusts report. here. Growls readers may also want to write to their state legislators. The following legislators represent Arlington County in the Virginia General Assembly: Senators (Adam Ebbin, Barbara Favola, or Janet Howell) and Delegates (Rip Sullivan, Patrick Hope, Alfonso Lopez, or Mark Levine). Contact information for members of the General Assembly can be found here -- use one of the "quick links" to locate the senator and delegate who represent you. To learn more about the Pew Charitable Trusts, click here. Two items in this week's Arlington Sun Gazette (August 3-9) are worth the attention of Arlington County taxpayers who believe in fiscal responsibility. They involve the proposed purchase of the single-family property at 1721 North Culpeper Street. "Arlington School Board members on Aug. 17 will consider a staff proposal to purchase a single-family home adjacent to Glebe Elementary School, which would be torn down and the lot used for emergency-vehicle access to the elementary school. "School-system staff has proposed purchasing the home at 1721 North Culpeper St. for $525,000, while setting aside an additional $50,000 for closing and demolition costs. "Currently, the only vehicular access to the school is via an easement from Capital Life Church, which funnels traffic to and from North Glebe Road. "If the home is purchased, the land would be used only for access by emergency vehicles, school officials said. "The prospective purchase drew some pushback during a public-comment session, in part because the school system plans on spending nearly $125,000 more for the property than it sold for this past January, when a Falls Church-based investment firm purchased it for $403,655, according to county-government records. "John Chadwick, the school system’s assistant superintendent for facilities, said the purchase made sense, since the school system has no vehicular access outside the church easement." The second item, the more important in our humble opinion, is the first "Highs & Lows" on the opinion page. The editor uses the space to argue against the staff proposal -- "no doubt well-meaning" -- "from Arlington Public Schools staff to purchase a single-family home adjacent to Glebe Elementary School," for use "as an emergency-vehicle-only access point to the school." "Call us fiscal reactionaries if you will, but given all the current and pending capacity needs the school system must contend with, spending $575,000 on this seems decidedly in the “nice-to-have” category rather than the “must-have” category. Student safety will not be endangered if the purchase doesnt take place, and will be only marginally enhanced if it does. "School Board members are slated to vote on the matter on Aug. 17. It will be a very good test to see whether board members simply talk the talk of pinching every penny, or will walk the walk of tough decisions." ACTA apologizes for the technical difficulties experienced over the past two weeks, which prevented your humble scribes from growling. We look forward to growling for you. In last Thursday's Washington Times, Stephen Dinan reported, "The Obama administration “misled” Americans into thinking signing up for Obamacare would be cheaper than it really was, according to an inspector general’s report Thursday that said the IRS dramatically understated the actual cost of enrolling." "But as part of the letters, the IRS said most people could find plans for $75 a month or less once government subsidies were figured in. "That was untrue — in fact, the average cost was more than twice that figure, at $168 a month, the Treasury Inspector General for Tax Administration said. "Many of the nearly 7.5 million taxpayers who receive letters and seek insurance may feel misled if the actual cost of their insurance is much higher than the $75 per month detailed in their notification letter,” the inspector general concluded. "The IRS said it was only using numbers provided by Department of Health and Human Services and verified by the Treasury Department. They said the $75 figure was true for some taxpayers. "The inspector general said it asked for that documentation but never received it. "Auditors said their own analysis found the HHS studies were based on a smaller sample and was limited to those who chose lower-coverage plans with fewer benefits. "According to the new audit, federal regulations require agencies to present accurate information. "Investigators uncovered the misleading information as part of a broader audit about how the IRS was handling its role in alerting Americans who aren’t complying with Obamacare’s mandate to hold insurance. "Some 19.3 million Americans ducked the Obamacare mandate in 2016, with 12.8 million claiming an exemption and 6.5 million paying the tax penalty." The Treasury Inspector General for Tax Administration (TIGTA) issued a press release about the report, pointing out, "Although required by the Affordable Care Act (ACA) to do so, the Internal Revenue Service (IRS) did not issue notification letters to taxpayers without Minimal Essential Coverage (MEC) for Tax Year 2014 by the statutory June 30, 2015, deadline." According to the TIGTA report, the "audit was initiated to assess the IRS’s processes for identifying and notifying individuals who file an income tax return and do not have the required Minimum Essential Coverage under the Affordable Care Act. This includes assessing whether the IRS complied with Affordable Care Act Section 1502(c)." The Center for Immigration Studies reported that AG Jeff Sessions is getting serious about cutting federal funding to sanctuary cities and counties. Arlington stands to lose $44k.